Paige Dolecki - Stampologist: 365 Cherish the Day with CTMH November Stamp of the Month "Cherish the Day"
365 Cherish the Day with CTMH November Stamp of the Month "Cherish the Day"
Welcome to the CTMH November Stamp of the Month blog hop featuring the set Cherish the Day! If you have come here from Angela's Blog, you are on the right path! We have over 50 Close To My Heart Consultants sharing their creations using this month's SOTM and other great CTMH products on their blogs. To hop through the whole list simply click on the link at the end of each post in the hop. This layout is different from my usual style but I love the clean graphic feel created by evenly spacing the stamped tags across the page. I wanted to create a layout that celebrates not just one day but all 365 days of the year that I cherish my family. Here is a close up of the Cricut cut and layered numbers - I've layered a decorative Buttercup cut directly over an Indian Corn Blue cut of the same size and then lay them both off-set on a slightly larger black cut. And here is a close up of the tags (cut with Art Philosophy Cricut Cartridge) and stamped in Indian Corn Blue. Each tag is numbered with the month in Buttercup - not high contrast but it helps tie in the buttercup buttons, ribbon and top number layer. Now "Hop" on over to Beth's Blog to see her work! Be sure to visit all the Consultants at their blogs to get some great crafting ideas! Remember, the November SOTM is only available until the 30th! To order your set click here! Paige - I LOVE THIS!!! Awesome idea & perfectly executed! What a great idea! Nice job! Super Stampy Idea for a page ! Fabulous idea for a layout - perfect color choice. 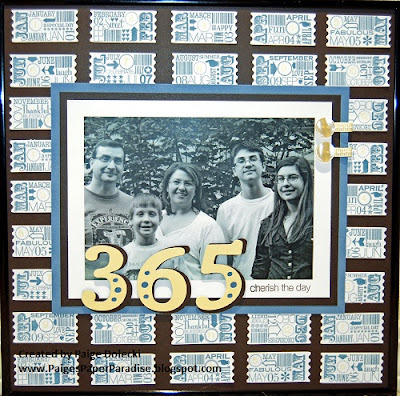 Definitely want to steal this great idea for my family album! Great Idea !!! Love it!!! 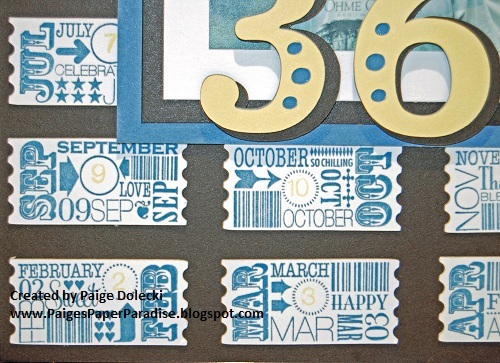 Another fun way to use this WONDERFUL stamp set! :) Thanks for sharing! I love the layout and the idea behind it! You've been awarded a blog award. Check out my blog after November 4 for all the details. What a very special layout and such a creative idea. Your layout looks great, and better yet, has a great message! Fabulous idea! I like the clean look. Such a simple plan with an awesome look! I love that you have created your background with this stamp! what a fantastic project Paige!